I got this genius fancy garland idea from View Along the Way. 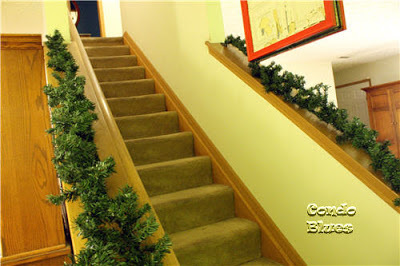 Kelly uses the anemic fake garland as a base and dresses it up with live greenery. After our mini vacation to Michigan (you can read about everything we stuffed in our gobs here and our trip to a 5 football fields large Christmas store here) I went from meh to let's go crazy with the Christmas decorating after we came home. I am allergic to every living green thing (ironic for a green blogger, eh?) I've been Team Fake Tree since my second Christmas. Husband grew up as Team Live Tree and misses the house smelling of pine at Christmas. I figure we both get something out of this project. I get the full fancy Christmas garlands I like. Husband gets the pine smell he likes. Win - win. I'm taking a bit of a pollen risk with live evergreen branches in the house. So far, my allergies haven't been better or worse than usual. Since this worked out we might give Team Fire Hazard, I mean Team Live Tree, a try someday. Real evergreen Christmas tree branches - I followed Kelly's advice and asked the people in the Lowes Christmas tree department if I could buy the branches they trim off the bottom of live Christmas trees. The guy wouldn't sell them to me. He gave me as many as I wanted free! Note: Some Christmas tree lots sell the extra branches for cheap. Either way, it never hurts to ask. 2. Attach the fake garland to your surface if applicable. I folded my garland back upon itself and attached it to my banister with three Command hooks to keep it in place. The top hook does all the work. 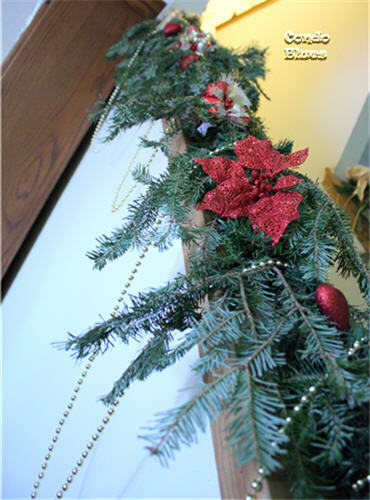 I attached the garland to hooks stuck to the middle and end of the banister for stability. 3. Use the clippers or heavy duty scissors to cut down the branches of the evergreen tree into manageable sprigs. 4. Artfully shove the evergreen sprigs into the fake garland to make the garland as full as you desire. I should have turned my evergreen branches right side up before sticking them into the garland for a better look. Oops! 5. 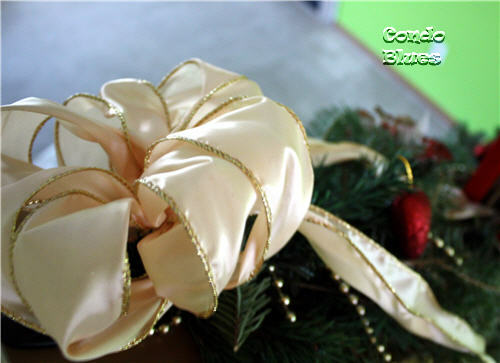 Make a fuffy bow of wired ribbon and use it to hide the hook you used to hang the garland. 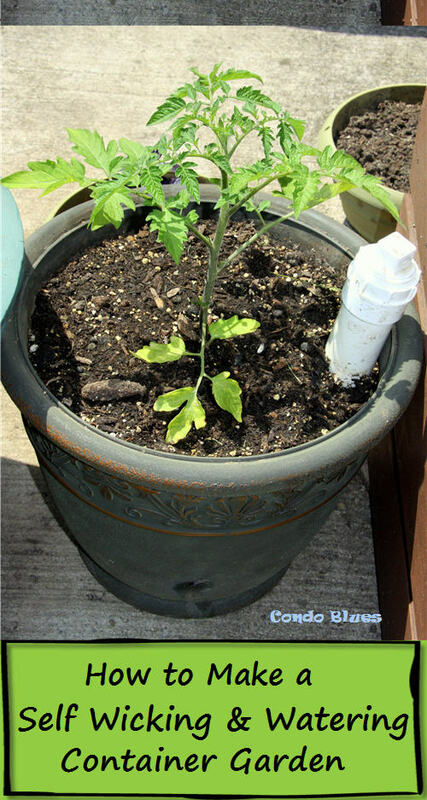 Tip: I save the cardboard ribbon spool. When it is time to take my Christmas decorations down, I untie the ribbon, wrap it on the spool, and store it in my decoration box. That way I can use it for a different Christmas decoration in the future. 6. Add extra ornaments, flower picks, etc. as desired. You might remember the packages and glitter poinsettias from the sparkly glam outdoor Christmas decor I created a few years ago. In Denmark it is a Christmas tradition to decorate with hearts. I bought my Danish Christmas hearts during Valentine's Day a few years ago and put them in my decorating box for a project just like this. 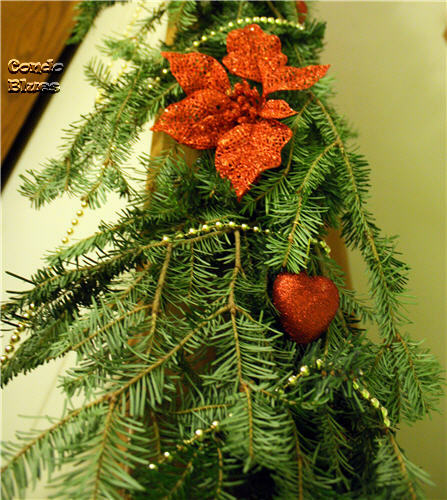 I used to use the gold bead garland on our Christmas tree. I haven't used it since we bought our condo. 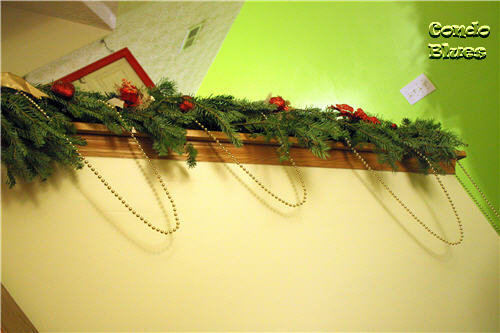 This year's soon to be lush garland was not entirely free because I had to buy the cheapo fake evergreen garland base. While I was at the store, I picked up 2 spools of wired ribbon for $1.00 each, and a box of black Command hooks to hang the garland. I spent $12.00 on this project. I had the rest of the decorations in my Christmas decoration box. If I do it again next year (I don't put out all of our decorations every year. I also switch the things we have up to make them look new and interesting.) this project will cost ZERO DOLLARS. Yay! 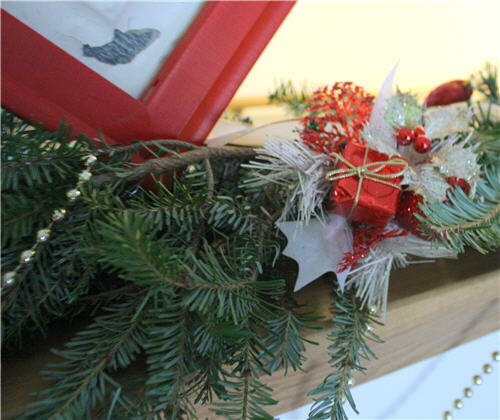 What a great idea to spruce (no pun intended) up some fake garland with the real deal! And the idea of asking for the leftover branches? Brilliant! It looks great! Great idea! 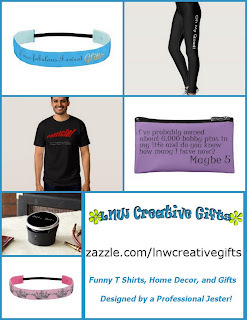 I love frugal! Fantastic idea :) Looks great!